The eternal power which the Brahman represents, that is ever effulgent, the source of knowledge, that illuminates the whole universe is manifested as Arunachala and shines brilliantly at the mountain of Tiruvannamalai. The name Arunachala spells truth, knowledge and bliss. The word ‘Aruna’ symbolizes light that removes darkness and ‘chala’ indicates stillness. The grace that originates from Arunachala pervades all over. Lord Siva is ever present here in His Linga form. Lord Arunachala appears in Tiruvannamalai in form and without form and his beginning or end was inaccessible even for Brahma and Vishnu and therefore the Lord has come to be known as ‘The inaccessible Lord of the mountain’ (The word ‘Anna Malai’ meaning inaccessible). But in fact he is very easily accessible. He even used to beckon the devotees towards Him. He had beckoned the devout Kings belonging to different periods and different dynasties like Pandya, Chola, Hoysala and Krishnadevaraya. He has called the saints, sages and devotees. Having heard his call, many came to Him and experienced His grace and Venkataraman was one among them. Venkataraman was born to Sundaram Iyer and Azhagammal couple at Tiruchuzhi, some 30 km. from Madurai. He was 12 years old when his father, Sundaram Iyer died. With the demise of Sundaram Iyer, Azhagammal, the mother proceeded to Manamadurai and stayed with the family of Nellayappa Iyer, the younger brother of Sundaram Iyer, along with Nagasundaram and Alamelu. The eldest son, Nagaswami and Venkataraman went to Madurai and stayed with another brother of Sundaram Iyer, Subbaiyer. Subbaiyer sent Venkataraman to Scott’s Middle School and later to American Mission High School. Venkataraman found school games more interesting than studies. He loved sleeping. He had a very good memory. Venkataraman was about 16 years then. Rather than studying lessons, he started contemplating on various aspects on spirituality. He used to stand before the image of Meenakshi temple at Madurai soliciting the grace of the Goddess. He happened to get the book ‘Periyapuranam’ that dealt with the devotion of 63 Tamil saints, Nayanmars. He was greatly inspired by the kind of devotion and dedication shown by the saints like Manikkavachagar, Jnana Sambhandar, Sundaramoorthi, Naavukkarasar etc. Gradually, a spiritual current of awareness began to wake him up which grew stronger over the years. Then an event happened that marked a great turning point in his life. He had an unusual experience of death which brought a transformation in him. It happened about six weeks before he was to leave Madurai for good. It happened suddenly. When he was sitting alone in his uncle’s house at Madurai, a sudden fear of death over took him. He felt he was going to die. He then started ruminating about death. The thought or fear about death comes to everyone at some point of time in his or her life but very few possessed the courage to enquire into the question of death seriously. Young Nachiketas was courageous enough to go and knock at the door of the Lord of Death, even when his time was not up. Maharshi too pondered over the question of death seriously. What death means? What is it that is dying? What happens after death? He was determined to find out. He then lied down imagining himself to be dead. “Let not the word ‘I’ or any other word be uttered”, he said to himself. He wanted to create a scene of his own death. Then, the legs became stiff, the lips were tightly closed, the eyes were closed and even breath stopped for a while, but the consciousness remained. Though body equipments and sense organs were not working, the inward perception was there. He visualized his body being carried to the burning Ghat and turned into ashes. He then questioned whether by the death of his body, is he dead. He asked himself: “Is this body represents “I”?” Even though the body was silent, rigid, still and inactive at that moment, he could feel that there was a force or current, a centre of energy, playing on the body. That was the first time he felt that way. It dawned on him that the material body dies but the spirit transcending it cannot be touched by death. “I am therefore the deathless spirit”, he said. “It was that current, force or centre that constituted my Self and kept me acting and moving. I had no idea of my Self before that. From that time on, I was spending my time absorbed in contemplation of that current.” Bhagavan said. He felt as if some spirit had possessed him. The focus of his attention then turned on “I”. Absorbed in the Self, he emerged as a realized person. Ever since, he continued to remain conscious of his Self. Other thoughts may come and go but the Self knowledge remained steady for ever. The experience has brought about a realization in him. The fear about death had vanished as he is now absorbed into Self and he knew that there was no death to the Self. After the experiment with death, some changes were visible in Venkataraman. Suddenly, the world around him, the external forms and images all appeared to have lost relevance. He avoided company of friends and preferred to remain withdrawn to himself. He went to the Meenakshi temple not with friends as before but alone and not to pray as before but to let himself go silently deep within. In fact Venkataraman experienced the actualization of the above words. Since his individuality has ceased and he has sufficiently matured, Lord Arunachala has called him near. Having heard the call, he could not stay in his house any longer. He wrote in a piece of paper that he has set out in quest of his father in accordance with His command and nobody needs to search for him. He left the note in a prominent place and embarked on a journey with Tiruvannamalai as his destination. He was least worried how to reach Tiruvannamalai or where his next meal would come or where he could find a shelter. He has deserted everything belonged to him and came to Arunachala. His destination was far away. He did not know the details about connectivity of trains. He did not have enough money in his hand. All that he had was determination to reach the Lotus Feet of Arunachala. With Arunachala occupying his mind, he set out to Madurai station to embark upon his journey to Tiruvannamalai. It was a long and hard journey, a good part of it he covered by train and a part by foot. Tired and exhausted, he almost broke down. There was nothing to eat and no shelter and his body had lost all its strength. However, someone came, in some form or other, helped him with food and shelter and lit up the spirit of life in him. He managed to resume journey with the money he borrowed by pledging his only possession, an ear ring. As the sun was rising on the eastern horizon on 1st first September 1896, the train carrying the most ardent devotee of Arunachala scratched to a halt at Tiruvannamalai. The tiredness and exhaustion disappearing, the devotee rushed to the temple of Arunachala as if to establish a lost link. Surprisingly, the doors to the sanctum sanctorum were opened and the Lord appeared there in all his splendour and glory. There was nobody inside the temple at that moment. This was the moment he was waiting for. He feasted his eyes on the Lord, went near the deity and embraced the Lord with his two hands. While taking bath in the tank of Arunachala temple, some coins and paper were all that belonged to him. He threw them away and dipped himself in the tank. The spirit of surrender was complete. When the individuality is ceased and surrender was complete, the Lord has taken over. He was no more the Venkataraman the world knew of. He has become a Jeevan Mukta, moving around with a body but ever conscious of his Self. He has immersed into Lord Siva and never felt the need to come here again. He came out and walked towards the Ayyankulam tank. On the way, a barber called him and offered to shave off his head. Bhagavan then went to the main hall of the temple, known as Thousand Pillared Hall and sat there in meditation. As he remained silent most of the time, he was called Mouna Swamigal. He then moved to a secluded spot, called Pathala Linga Sannidhi, located on the circumambulation route. Sri Seshadri Swamigal and other devotees took special care to locate Maharshi and place him at a comfortable place. Maharshi moved from one place to another till at last, in September 1899, he found solace and peace in a serene surrounding called Virupaksha cave, located on the eastern slope of the hill. Here, most of the time Maharshi was found in a state of silence, Samadhi and introspection. . “Sometime when I opened my eyes, I found it a day. At some other time, it was night. I never knew when the sun rose or set”, he said. During the period of his stay here, he had totally detached himself from the world and turned within. He was unaware of the existence of body or its needs and remained unresponsive to any external moves. Here, he had occasions to study many scriptures and literatures, meet disciples like Sivaprakasam Pillai (1) and Kavya Kanda Muni (2). Maharshi stayed here and nearby places for almost 17 years, contemplating, meditating, meeting devotees, guiding them and gracing them. 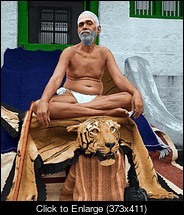 Maharshi studied Kaivalya Navaneetham, the most authoritative Tamil works of Sri Thandavaraya Swamigal that contained the essence of Vedas and Upanishads, Yoga Vasishtam, the essence of teachings of sage Vasishta to Lord Sri Rama, the Tamil version of Adi Sankara’s Viveka Choodamani and the songs of Saiva Sidhars and Thiruvai Mozhi composed by Nammalwar. He studied Ribhu Gita (3), the translated version of the original Sanskrit epic ‘Sivarahasya’ which described in dialogue form the nature of the Self and Self as the reflection of Brahman. “As I studied the sacred books, I found that they were analysing what I had already felt intuitively.” Though traces of Vedanta and concepts of Upanishads reflected in his teaching, they were only similarities which tallied with his own experience. Maharshi then moved to Skandasramam, located at slightly higher the hill. Skandasramam consists of an outer verandah, an inner room and a room that overlook the northern tower of Arunachala temple. Bhagavan stayed here from 1916 to 1922. Maharshi’s mother, Azhagammal, had also come and stayed in the Ashram, engaging herself in kitchen and devotional work. Nagasundaram took sainthood from here and came to be known as Niranjananda. Azhagammal too received Mouna Deeksha from her own son and started leading a saintly life, apart from attending to the needs of Maharshi. Gradually, old age started showing signs of weakness and Azhagammal became bed-ridden. Maharshi attended her with great care and affection. On May 19, 1922, the mother who presented to the world an outstanding spiritual leader bid farewell. While the last rites were being performed, Maharshi stood silently displaying no signs of any emotion or grief. Her mortal remains were laid to rest at the foot of the Arunachala hill. A Samadhi called Matrubhuteswara, Lord Siva in the form of Mother, was built there. With holy waters brought from sacred rivers like Ganga and Kaveri, Kumbhabhishekam of Matrubuteswara was consecrated on 14th March 1940. Quite often Maharshi used to go to Samadhi at the base of the hill and also for circumambulation of the hill (Girivalam). Devotees followed him by rendering songs in praise of Arunachala. Gradually, Maharshi decided to stay at the thatched shed of Ashram near the Matrubuteswara temple. Devotees came to Maharshi in large number and sought answers to various questions that bothered them. They wanted to know what knowledge is, how it should be acquired, how to overcome miseries and why sufferings continue to exist. Invariably, Maharshi’s response was: “Find out who is suffering”. The sufferings arise out of identification of the self with the mind and body or mistaking the non-self as the real self. Sufferings are borne by the body and mind. The Self which is supreme and eternal is not affected by any changes occurring to the body or mind. Once the person knows the ‘Self’, the sufferings which belong to the mind and body no longer affect him or her. Maharshi’s health condition became a cause for concern. However, he continued with his usual activities like reading the books, receiving visitors, peeping into the kitchen, visiting Matrubuteswara temple etc. While the physicians, disciples, devotees and others were concerned about Bhagavan’s health, the one who was least concerned was Bhagavan himself. His face was serene and calm as ever before. Rather than the devotees consoling Bhagavan, it was Bhagavan who was consoling them. Though a team of doctors mobilized all their expertise and knowledge, they could not keep away the death which came at the appointed hour. On 14th April 1950, while devotees were chanting Akshara Mana Malai hymns, those splendid eyes which kindled the light of love closed their lids. Many devotees have witnessed a strange phenomenon at that moment. A brilliant comet moved towards the mountain and beyond and disappeared into the sky. The soul of Maharshi has attained immortality. The body of Maharshi was buried at a particular spot near the Mathrubuteswara Temple. After the ritual, the pit was filled with flowers, the sacred ashes of Vibuti and sands and closed with granite slabs. Maharshi’s Samadhi came up here. Bhagavan has shed his mortal remains but the spirit of Bhagavan lives on. He may not be physically present, but his grace can be experienced throughout the Ashram premises, its surroundings, the hall, the kitchen, the Girivalam route and the whole area. Though he was not around, the light that he left behind still shines, guiding all devotees. “How can I go from here”? “Where can I go”? He had said once. The Sastras says that one who has attained the state of Brahman retains his power even after his demise and he continues to grace the devotees from his Samadhi. According to Thirumular, a Jnani becomes Brahman irrespective of physical body. He would continue to guide his disciples and lead them to liberation. One may not be able to see him or feel him through senses, the elements which he detested all through his life. He who transcends above his bodily and mental identifications can perceive him, comprehend him and experience him. Maharshi has advised two paths towards self-realization; the path of self-enquiry and the path of surrender. He himself set an example by adopting these means. Enquiry means exploring the consciousness, going beyond mind and body and remaining in a spirit of bhakti, vairagya and concentration. Bhagavan ever remained in the consciousness of his Self. By setting himself an example, Maharshi has shown the path of surrender. He renounced everything he held dear and went away from home in search of his Self. He was least worried as to where his meal would come from or where his shelter would be. His only aim was to take refuge at the Lotus Feet of Arunachala. He had surrendered his individuality totally to Arunachala. If his body needed some food or rest, he left it to God to take care and the Supreme Power that operated the whole universe did take care of him. Someone came, in some form or other, with some service or other that helped to keep the fire of life burning in him. There was nothing he kept for himself. He had totally surrendered unto Arunachala. Though he was tired and exhausted on his way to Arunachala and fell to the ground, there was someone to lift him up, give him the food and shelter and light up the spirit of life in him. “Surrender unto Arunachala and you would find your way” that seemed to be his forthright message. Arunachala was not a mere hill for Bhagavan. It is the manifestation of Siva. All that the devotee should do to experience the presence of Bhagavan is to come to Arunachala in whom he has merged.